Is there a rift between the democratic party and the Obama administration? I have written about Goldman Sachs and how the investment firm contributed to the worst financial crisis since the Great Depression. Matt Taibbi alluded to GS as The Great American Bubble Machine contributing substantially to all major investment bubbles since the 1930s. GS has always been a talent hotbed where privileged alumni leave the firm through what Stieglitz calls a revolving door to end up in critical positions of government. The list of those exiting Goldman and entering the government is long, but it is clear that they are all associated with the Democratic party. Next to this one there could be another list, one of detrimental political decisions that contributed to the current crisis. On top of it is the repeal of the Glass-Steagall-Act under former GS employee and Bill Clinton’s Treasury secretary Robert Rubin, which allowed bank holding companies to own other financial institutions and eventually become too big to fail and a systemic risk. This of course was never intended but as we painfully recognize one of those far-reaching wrong judgments made by a democratic administration. In light of this anything but impeccable track record we have to ask if democrats are truly forthcoming in their desire for real change or are they about to make another big mistake? In November of 2008 a new spirit of political leadership in the US was finally entering into the halls of congress and the White House. President Obama has promised to bring change to Washington and the democratic party vowed to stand beside him and his ambitious agenda. In the meantime democrats together with two independents have a sound filibuster majority of 60 in the senate. They are now calling the shots in the government and the legislature. It is therefore even more disturbing to see how the House of Representatives overwhelmingly rejected a signing statement from their president. In June a $106 billion war supplemental bill passed legislation in the House and Senate which included conditions on World Bank and IMF funding. The bill would extend a credit line of $108 billion for international financial institutions (IFI) to aid struggling developing economies crippled by the current financial and economic crisis. Major recipients of IFI funds could be nations in Eastern Europe under immense pressure to devalue their currencies in an attempt to avoid a default scenario. This would have a ripple effect and threaten the stability of the global financial system similar to events during the Asian crisis in the late 90s. Despite severe and eventually devastating consequences to an already ailing global financial system of such a devaluation scenario, resistance is mounting among lawmakers who view IFI funding as an unnecessary ‘global bailout’ . To reach a compromise and find the votes to pass the bill House and Senate leaders included restrictions resulting in an amendment requiring the Treasury department to report on World Bank and International Monetary Fund (IMF) activities. Late Thursday the amendment passed with strong bipartisan support and an overwhelming majority of 492-2 votes against the Obama administration. The president in a statement during signing of the original bill rejected this restrictions and vowed to ignore the amendment’s conditions. They would "interfere with my constitutional authority to conduct foreign relations (with international organizations and foreign governments)… by requiring consultation with the Congress prior to such negotiations or discussions," Obama said in the signing statement. With the passage of the amendment lawmakers including Barney Frank, a democrat and head of the powerful House Financial Services Committee (HFSC), are now threatening to withhold funds in a stand-off with the Obama administration. 492 to 2 speaks a clear language and it remains to be seen if the administration can afford to ignore congress under these conditions. Though it certainly would mean a severe blow to the authority of the president if he will be forced to revoke his signing statement. His foray into environmental politics (see also here), for the first time opening up the United States to international commitments to substantially reducing carbon emissions, could be called into question. So could his commitments he made during his Moscow speech (see also here), to the establishment of an international body together with and under the leadership of the U.S.
Much needed reform in Washington away from neoliberalism towards true and sustainable world leadership hangs on a thread. While first signs emerge of a search for an effective international body that more truthfully represents interests of all nations in a global economy, the coverage of the G-8 summit in Italy by mainstream media in the U.S. suggests otherwise. The Times also calls into question the relevance of the G-8 if they seemingly cannot take landmark action without enlisting others, and misses the point completely: It is not about relevance of the G-8 but rather about sustainable credibility within the G-15, G-20 or even G-194. It is not about America but rather about sustainable relations between all nations in a political and economic environment more and more intertwined by globalization. If we have learned nothing else from the current financial and economic crisis this should be it. Leaving other nations out makes the G-8 nothing but an elite club of snobbish leaders who in a reactionary move desperately seek to conserve neoliberal, neoconservative mindset. Barak Obama, Angela Merkel, Nicolas Sarkozy and other powerful leaders understand that and therefore support this search for a new international world order. Reactionary dinosaur politicians will eventually face the same destiny. In the meantime there are still too many of them and they are still very powerful. President Obama’s stand-off with the congress on the issue of the signing statement serves as a litmus test about the determination towards change in a modernized America. Yesterday US president Obama for the first time offered a passionate defense of Ben Bernanke, chairman of the Federal Reserve. Bernanke did a fine job and performed well during the crisis. This support is supposed to strengthen Obama’s position on reform and oversight of the financial-services industry. He plans to vest almost unlimited power with Bernanke and the Federal Reserve and this has drawn some criticism. Many blame the Fed for the current financial and economic crisis and despite drastic actions by the Fed and other central banks around the world, global growth has continued to contract. Here is an update on the most recent forecast for global growth and despite some improvement it ain’t looking good. 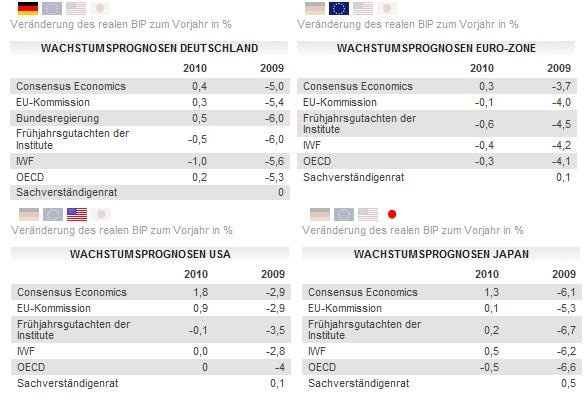 World Bank lowers Euro-zone GDP growth forecast dramatically from minus 2.7 to minus 4.5 percent GDP growth for 2009. US GDP will also contract by 3 percent, worse than the previous 2.4, and Japan by 6.8 percent versus 4.3 percent contraction of GDP in 2009. According to WB the recovery in 2010 will also be more tepid than previously thought. A modest better growth uptick is expected for China, Russia and India. According to the International Monetary Fund (IMF) the recovery from the global recession will be stronger than previously thought but deleveraging of private and public households, slow credit growth, unemployment and shrinking private wealth will slow down recovery. For 2009 global growth will contract by 1.3 percent according to the IMF. Global trade is expected to plunge by 9.7 percent this year, while total gross domestic product for high-income countries contracts by 4.2 percent, the bank said. Economic growth in developing countries should slow to 1.2 percent — but excluding relatively strong China and India, developing economies will contract by 1.6 percent. The WB sees a projected recovery beginning at the end of 2009 but expects it to be much less vigorous than normal. The deepest global recession in over 60 years is close to bottoming out, but recovery will be weak unless governments do more to remove uncertainty over banks’ balance sheets, the Organization for Economic Cooperation and Development (OECD) said Wednesday. The economy of OECD countries will shrink by 4.1 percent in 2009, slightly better than a 4.3 percent from the previous forecast. But the recovery "is likely to be both weak and fragile for some time” . The OECD forecasts return to an average of 0.7 percent growth across its member countries in 2010. In the US recovery "could be uncharacteristically weak and insufficient" .